District One Residences is a gated community of one, two and three bedroom apartments nestled amidst picturesque surroundings with world-class family-friendly amenities right at your doorsteps. Situated in low and mid-rise towers spanning four to sixteen stories from the ground up, these contemporary cutting-edge homes bathed in natural light streaming through ceiling to floor windows, offer stunning panoramic views of the Water Body and neighboring lush green corridors. Minutes away from the glistening Crystal Lagoon, each of District One’s eighteen distinctly styled mansions is meticulously designed to ensure affluent tranquil living in glorious surroundings. Whether it is a traditional arabesque ambiance with a modern twist you’re looking for, open spaces and artistic minimalism you’re seeking or simply timeless European elegance – you’ll soon discover that extravagance is simply a way of life in these magnificent homes. Imbued with smart functionality and chic aesthetics, District One Villas come in three distinct Contemporary, Modern Arabic and Mediterranean styles that promise an unrivalled lifestyle of refined elegance while reflecting your individual taste. From the vast captivating architecture right down to the minute fine details, these homes create the perfect ambience for distinctly lavish living, every single day. Mohammed Bin Rashid Al Maktoum City - District One is only minutes away from many of Dubai’s world-class attractions, landmarks and transport links. 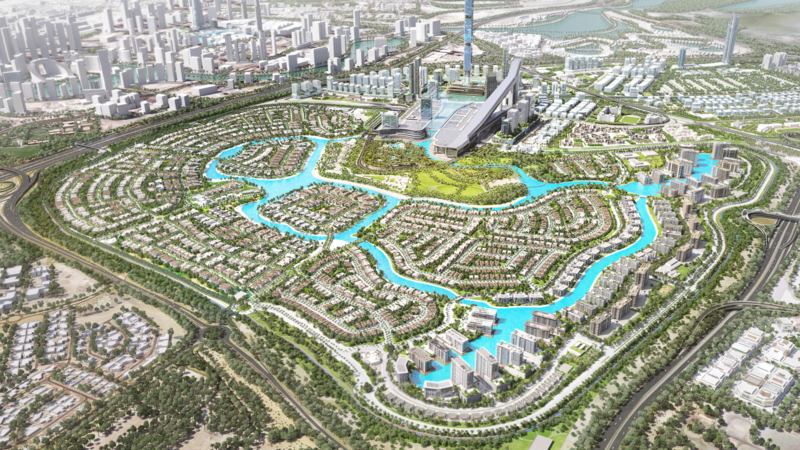 District One is next door to distinguished leisure facilities such as the Meydan Racecourse and Grandstand, The Track, Meydan Golf, a 9-hole floodlit golf course, the 5-star luxury Meydan Hotel and soon to be developed, Meydan One Mall. District One’s truly unique locale and lifestyle promises its residents a plethora of remarkable and distinct experiences. Mohammed Bin Rashid Al Maktoum City - District One is an exclusive and elegant lifestyle community set amidst natural surroundings in the heart of one of the world’s leading cosmopolitan cities. District One is located minutes away from Downtown Dubai; a premier destination for those that aspire to live extraordinary lifestyles. Located minutes away from Downtown Dubai, District One is the premier destination for those that aspire to live extraordinary lifestyles. The most innovative mall in the world will bring the city to life like never before. Discover it for yourself. The District One Water Body will be the first of it’s kind in the Middle East and upon completion, will become the world’s largest Water Body. From the vast captivating architecture right down to the minute details, these homes create the perfect ambience for distinctly lavish living, every single day. Come home to a close-knit community where everything is within your reach – from bespoke lifestyle experiences to serene downtime midst natural surroundings. For more information on Mohammed Bin Rashid Al Maktoum City - District One or to book a private tour of our show homes at the District One Sales Centre.